Do not forget to set the PATH variable as explained in the installation page. Let’s now have a look at the IDE tool, focusing on the menu options at the top of the window. File, Edit, Debug, Run, Plot and Devices. Actually this menu is the same as any other program file menu, where you can create new files, open existing ones and save them. Shortcuts are indicated on the right of the command. Let’s focus on the setting sub-menu. 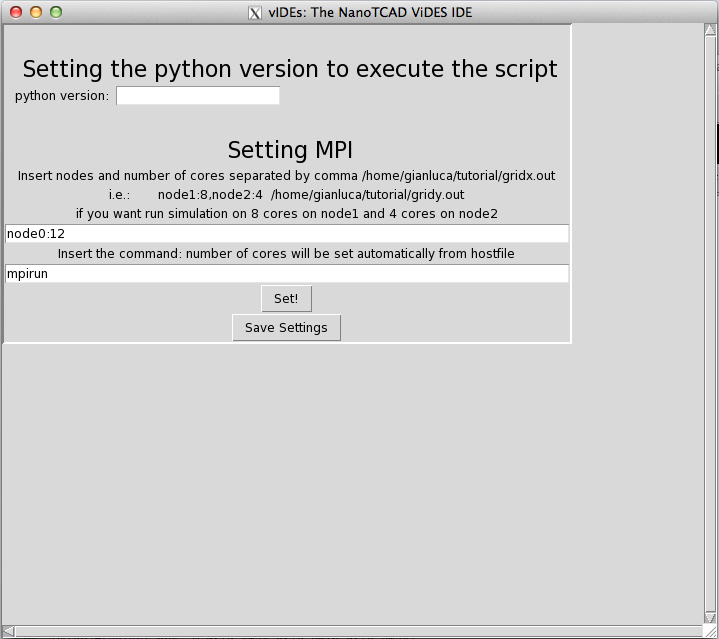 You can also run simulations in parallel, given that mpich2 is installed on your computer. In this case, everytime you open vIDEs, be sure to set the variables in the second and in the third available field. Do not forget to press the Set! button at the end, in order to make the changes/setting effective. Script can be debugged given that ipdb is installed on your machine. Have a look at the ipdb debugger for further reference. The defined script can be run using the run menu. Simulations can be run in parallel using the Run MPI option, given that parallel simulations settings have been defined, as explained above. Simulations can be easily killed through the kill command. 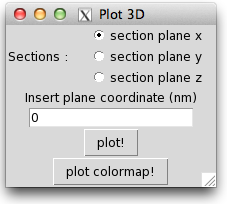 Through the plot menu, you can analyse the obtained results. value, while the second column the y value. An example of the output is shown below. With Plot 2D, you can instead plot electrical quantities defined on 2D grids. 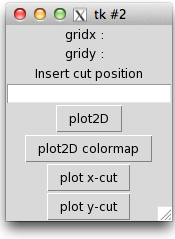 In order to do this, you first have to load the files containing the grid along the x and y axis (Load gridx and Load gridy options), which obviously have to be previously saved while running the simulation, as well as the file containing the quantity you want to plot (Load File option). Once you have done this, select the Plot 2D option and window as the one shown below will pop up. 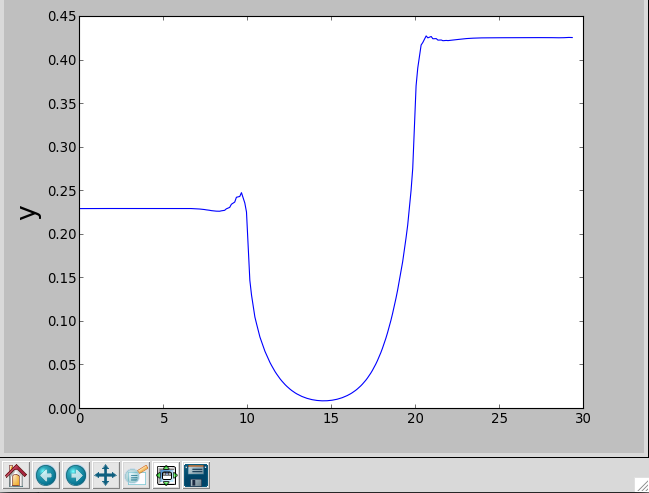 Pressing the plot2D button, you will plot a 2D picture of the loaded electrical quantity (which you can rotate, zoom etc. ), while pressing the plot2D colormap button, the colormap will be displayed. An example is shown below, where both the 2D plot and the colormap of the electrostatic potential in a MoS2 FET are depicted. 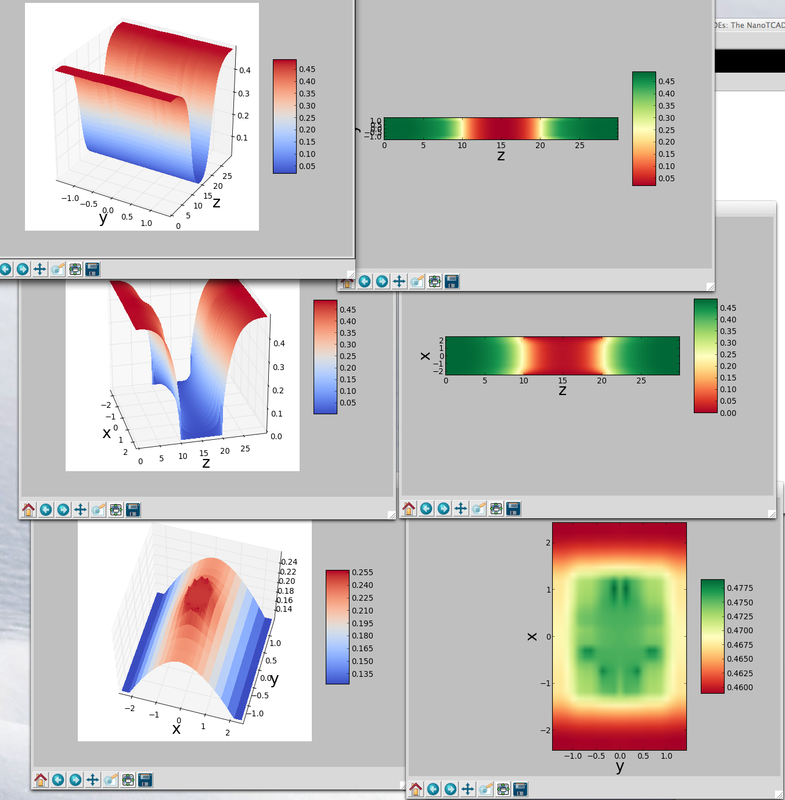 post-process such results, you need to use the Plot3D option. In this case you can perform cut along the x, y and z plane, specifying, as in the previous case, the coordinate at which you want to perform the cut. In the 3D case, also the grid along the z-axis has to be loaded through the Load gridz option. 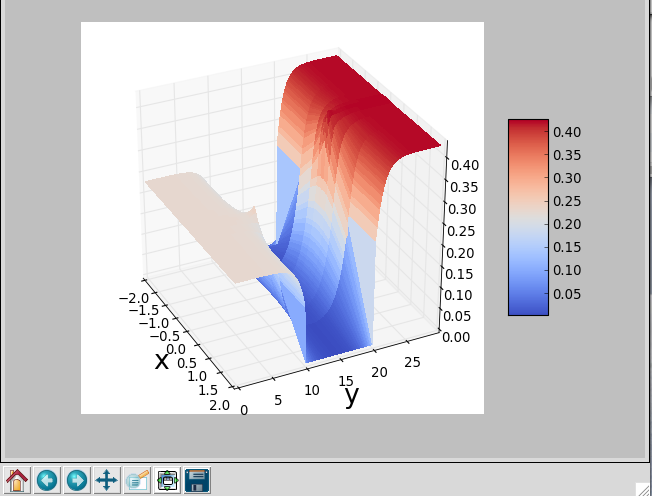 2D plot and colormap can be displayed pressing the button plot! 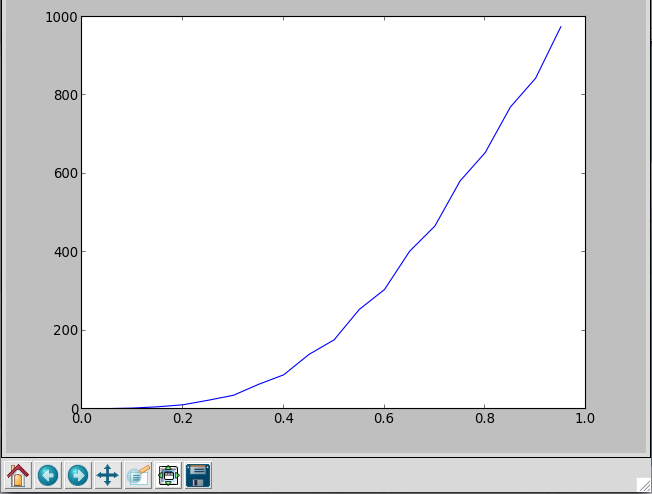 and plot colormap!, respectively. Some examples of cuts on different planes are shown below. 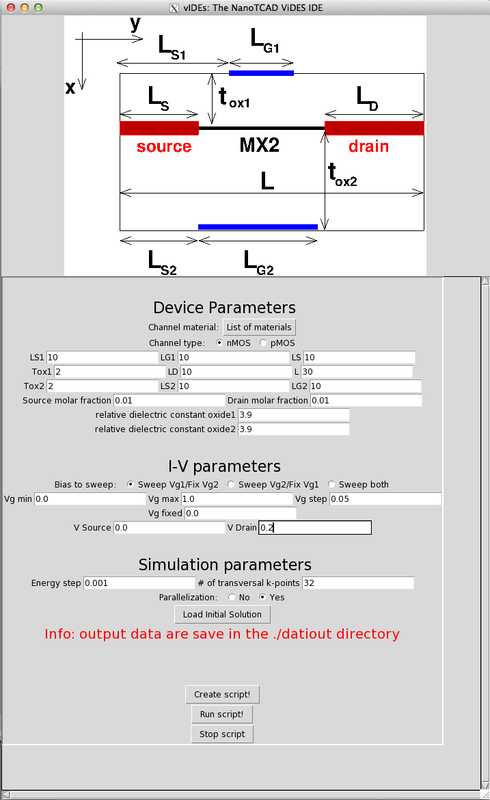 In the Device Menu, different device template are present, which can be used to easily define the input deck for the NanoTCAD ViDES simulator. graphene and Transition Metal Dichalcogenides FETs. Once chosen the device to be simulated, a window will pop up, as the one shown below, for the case of Transition Metal Dichalcogenides. The GUI is pretty much self-explicative and easy to use. In this particular case, we want to underline that four different materials can be simulated (MoS2, MoSe2, MoTe2 and WS2), and other 2D materials can be included under specific contract with Quantavis s.r.l. the setting parameters have been inizialized in the setting section of the file menu.